Both the 'Akademik Shokalskiy' and the 'Xue Long' have managed to break free from heavy ice in Commonwealth Bay, Antarctica, informs the Australian Maritime Safety Authority’s (AMSA) Rescue Coordination Centre (RCC Australia). According to the the U.S. Coast Guard, the Cutter Polar Star was released by AMSA from search and rescue duties after the Coast Guard Pacific Area command center received confirmation that both ships had broken through the heavy ice. 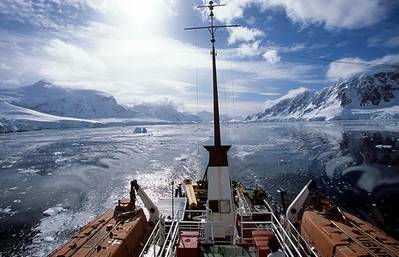 At about 7-30pm AEDT on Tuesday, 7, January, RCC Australia received a message from the captain of the Akademik Shokalskiy stating that about three hours earlier cracks had started to open in the ice around the trapped vessel. Slow movements were made in an attempt to break free from surrounding ice and a few hours later he reported that they had managed to successfully clear the area containing the heaviest ice and had begun making slow progress north through lighter ice conditions. Subsequently, RCC Australia was advised by the captain of the Xue Long that it too had managed to break free of the heavy ice and was making slow progress through lighter ice conditions. The Akademik Shokalskiy got trapped by thick floes of ice driven by strong winds about 1,500 nautical miles south of Hobart in Tasmania on Christmas Day 2013 while being used by the Australasian Antarctic Expedition (AAE) 2013 to follow the route explorer Douglas Mawson travelled a century ago. In attempt to free the Russian passenger ship, and after airlifting off its passengers, the Chinese Xue Long also became stuck in the ice.